Hi everyone! 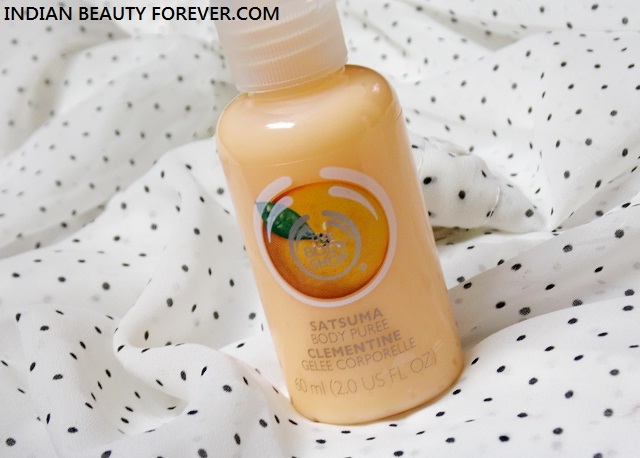 I will share The Body Shop Satsuma Puree Body Lotion and The Body Shop Satsuma shower gel. These 2 tiny gift size products are appropriate for gifting. The Body Shop Satsuma shower gel is for 425 Rupees for 250 ml and this The Body Shop Satsuma puree body lotion is for 695 rupees for 250 ml. Apart from the gifting purpose, I like that these tiny bottles are very travel friendly which is why I have already kept the The Body Shop Satsuma body puree in my bag so that I could use it when I need. I like small travel size bottles which are lot more easy to carry around. Let me start with the The Body Shop Satsuma Puree Body lotion first. Brand claims: This lightweight body lotion has a fresh citrus scent. 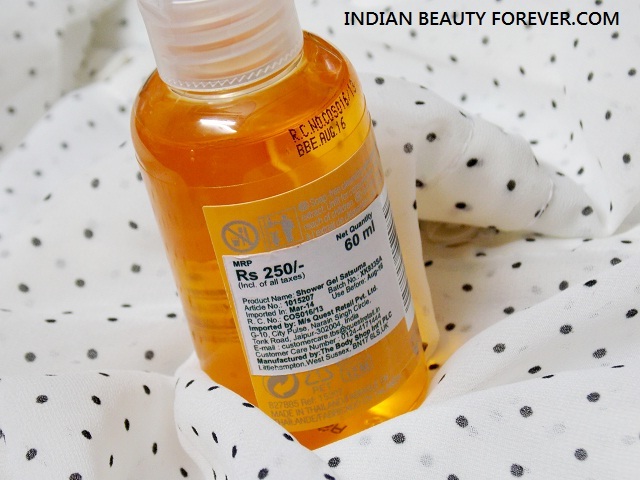 It hydrates skin and leaves it feeling soft and smooth. The Body Shop Satsuma Puree Body Lotion has a similar citrusy tangy fragrance as that of the Satsuma shower gels except for the fact that I feel the puree body lotion has more marigold scent which is quite prominent and evident. Once applied it oozes out a refreshing citrus scent which makes me feel good. It isn’t too thick like the other The Body Shop body lotions rather watery consistency once rubbed in. I find that the body lotion gives decent hydration and the scent stays on for 15- 20 minutes after which it gets milder and eventually fades off. As the hydration is only decent, it will not be good for the very dry skin, so if you have dry skin, go for body butters. In other way, it is more of a summer body lotion. Brand Claims: This soap-free shower gel contains zesty Satsuma essential oil and has a refreshing citrus scent. The shower gel has a very refreshing aromatic fragrance that instantly revives and rejuvenates by the citrusy scent. I am in anyways a fan of citrusy and fruity floral fragrances which is why there was no point in disliking the product. In fact, a lot of us tend to like citrus fruity scent especially in summers. The shower gel forms rich lathers which cleanse really well and leave the skin quite hydrated and supple. I like that it is not extremely slimy but just the perfect gel for all the seasons. The product has finished long ago and I will get hold of the bigger bottle once my current shower gel finishes but every time I think of getting a new bottle, I get a new sample of shower gel to try. Anyways, this is something which I absolutely love and is not at all expensive considering that the quantity used per bath is not much. After the shower, the tangy scent lingers the body for half an hour which I absolutely love. I will highly recommend The Body Shop Satsuma shower gel. You will like it. Take: Those of you who like citrusy refreshing tangy scent should certainly try this shower gel. It is worth the money and absolutely good to have.